Goran Ferčec (Koprivnica, 1978) graduated in Dramaturgy from the Academy of Dramatic Art in Zagreb. He is an editorial board member of the Performing Arts Journal Frakcija (Zagreb) and co-founder of the DK – dramaturgy collective initiative. 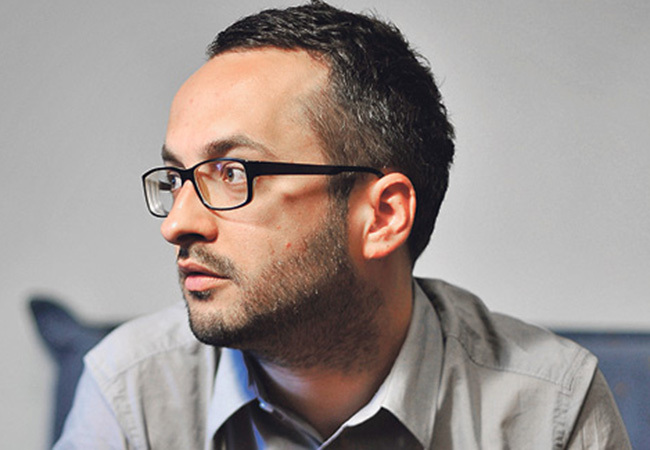 Since 2005, he has been publishing performance texts and theory in Croatian and international journals. His novel There Will Be No Miracles Here (2011) was shortlisted for all relevant literary awards in Croatia, receiving Croatian Ministry of Culture Award. His performance and dramatic texts have been performed by international ensembles, such as the fringe ensemble from Bonn. For his theatre work he received the following awards: Austrian Cultural Forum Award (Vienna, 2007), Croatian Theatre Award (Zagreb, 2014), Borštnik Festival Award for dramaturgy (Ljubljana, 2014 and 2015) and Veljko Maričić Award for dramaturgy (Rijeka, 2014). He participated in numerous artist residencies, such as Artist-in-residence grant Milo Dor (Vienna), Writers residency at The International Writers House in Graz (2014), Performative arts residency Dialoghi (Codroipo) and Absolute Modern in Skopje. Narrating about a man who is half-way between the two countries that are, in their own way, collapsing, Ferčec gave the novel universal, humanist message that transcends local boundaries and can be applied to the whole world. Ferčec's novel certainly is among the better achievements of the new Croatian prose. Ferčec's poignant and dark novel about a world that fell apart and identity that cannot be restored, original and expertly narrated, with many resourceful, dramaturgical, procedures.